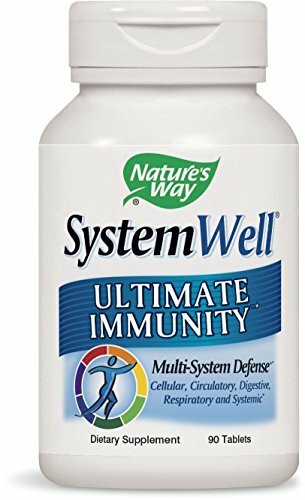 System well ultimate immunity 90 table supplement facts serving size: 3 tablets amount per serving% daily value***calories5total carbohydrate2 g1%dietary fiber1 g3%vitamin a (80% as retinol palmitate and 20% as beta carotene)5000 iu100%vitamin c (ascorbic acid)1 g1,667%vitamin d (as ergocalciferol)200 iu50%zinc (as amino acid chelate)15 mg100%selenium (as selenium monomethionine)25 mcg36%sodium5 mg circulatory immunity blend garlic (bulb) 170 mg, cordyceps (fruit body) 160 mg, cayenne pepper (fruit) 160 mg, ginkgo biloba (herb) 20 mg510 mg*systemic immunity blend Echinacea purpurpea (stem, leaf, flower) 250 mg, astragalus (root) 100 mg, olive (leaf) 65 mg, myrrh gum (tree resin) 40 mg455 mg*cellular immunity blend ip-6 (inositol hex phosphate from rice) 75 mg, mistake mushroom (mycelium, primordium and fruit body) 60 mg, shiitake mushroom (mycelium, primordium and fruit body) 60 mg, yamabushitake mushroom (mycelium, primordium and fruit body) 60 mg, reishi mushroom (mycelium, primordium and fruit body) 60 mg315 mg*digestive immunity blend arabinogalactan 95 mg, Oregon grape (root) 70 mg, goldenseal (root) 65 mg, fructo oligo saccharides 60 mg, primadophilus probiotic blend 2.7 mg (lactobacillus & bifidobacterium cultures)292.7 mg*respiratory immunity blend fenugreek (seed) 75 mg, horehound (herb) 75 mg, thyme (leaf) 50 mg, elecampane (root) 40 mg240 mg, lymphatic immunity blend Siberian eleuthero (root) 65 mg, guggul extract (gum resin) 65 mg, rosemary (leaf) 65 mg, plantain (leaf) 20 mg215 mg, pidermal immunity blend gotu kola (stem, leaf) 50 mg, aloe leaf blend 25 mg75 mg**daily value not established***percent daily values are based on a 2,000 calorie dietother ingredients: Vegetable modified cellulose, vegetable modified cellulose gum, vegetable stearic acid, vegetable magnesium stearate, silica, vegetarian glycerin. Warnings: Keep out of reach of children. As with all dietary supplements, consult your healthcare.